If a picture is worth a thousand words, then here’s a whole lotta words about Denali National Park in Alaska! From the Denali National Park website: “Denali is six million acres of wild land, bisected by one ribbon of road. Travelers along it see the relatively low-elevation taiga forest give way to high alpine tundra and snowy mountains, culminating in North America’s tallest peak, 20,320′ Denali (formerly Mount McKinley). Wild animals large and small roam unfenced lands, living as they have for ages. Solitude, tranquility and wilderness await. The bus system is a little pricey, and complicated to figure out. Make your reservation ahead of time or you may be waiting a while, or completely shut out that day. It’s completely worth it though if you want to see the interior of Denali. The first 15 miles you can drive in your car is still a beautiful segment and allows you to hike some trails and view several points of interest, but the park really gets the most rugged and wild beyond that when the road turns to gravel. Don’t miss the full experience if you can help it! Most of our animal sightings were deeper in the park, and being on a bus instead of driving gives you the ability to rubberneck and take photos and video to your heart’s desire! The best place to sit for panoramic mountain views is on the driver’s side on the way out, and the “passenger” side on the way back. If you want the full narrated experience, take a tour. If you want to be able to hop on and off at stops for hiking and breaks, take the green shuttle buses (this is what we did). We were worried about missing out on the narration, but our driver still did his best to educate us the whole drive and answer questions anyway! The drivers seem to love their jobs and want to make sure you have a good time. We wouldn’t want to drive this road ourselves anyway. Better to leave it to the professionals and enjoy the view! Here’s a list of items to consider bringing on your visit to Denali. The most important thing to note is that there’s no food or water available in the park once you leave the visitor center, unless you’re on a tour bus that provides a snack or meal, so plan ahead. There are bathrooms with vault toilets, but no running water at several stops. They do provide hand sanitizer. The Eielson Visitor Center at mile 66 does have regular restrooms with running water, and you can also refill your water bottles there. You can bring a bike on certain buses and pedal the park road a portion of the way, but the road is narrow, dusty when buses go by, and there are lots of steep drop-offs, so it’s not for the faint of heart! Hiking is mostly on unimproved trails, so unless you’re prepared for backcountry hiking you’ll want to stick to the more popular ones. The mountains in Denali tend to form their own weather, independent of the surrounding area, so planning ahead based on the area’s forecast doesn’t always help. Your best bet is to allow several days for your excursions in the park to see it in different weather conditions. You may even see lots of weather changes if you only have a single day out there (we did! ), so wear or bring several layers of clothes and a good rain coat. Don’t get discouraged if you don’t see many animals or Denali (Mount McKinley) – conditions can change quickly for or against your favor. We saw the mountain’s peak for a few minutes during a clearing in a storm, then it was back behind the clouds again. Here’s a list of other places you can view the mountain outside of the National Park. Denali (formerly Mt. McKinley) kept playing peek-a-boo with us. The best time to see animals is supposedly during cloudy periods, or during and after rain – so don’t let a dreary day stop you from visiting the park! They like to take their naps during the warmer and sunnier parts of the day and forage for food when it’s cooler. During sunny weather we saw very few, then when the weather turned more overcast they started coming out in droves. We didn’t camp in Denali, but you can – just be sure to make reservations. Camping beyond mile 15 in the park requires you to have a site booked ahead of time, and to stay at least 3 days – once you’re in, there’s no going in or out except by your own foot/bike power or on a bus! Past mile 2 you’ll lose all cell phone service, and plan to be fully off-grid with no electricity hookups at the campgrounds. More information about the park’s campgrounds can be found here. For a memorable adventure just outside the park (especially if you don’t have time to do the bus ride or just love the water too), consider a rafting or kayaking trip on the Nenana River. Rafting companies in Healy and just outside the park entrance in McKinley Park offer whitewater experiences or calmer scenic floats on the river that borders the national park. We did a 2-hour scenic guided float with Denali Outdoor Center and learned a lot about the area and national park, plus we had some great geology lessons up close while viewing the rock cliffs on either side of the river canyon. Click on any image below to enter a full-size slideshow of the entire album. Our first attempt at Denali was not a successful one – during nearby forest fires and before some rain moved through, visibility was terrible. We lucked into a day that was clear with some passing storms and clouds, so we seized the opportunity to do some exploring! Glad we aren’t the ones driving a bus on this! If you have a fear of heights you might want to close your eyes during some parts. 20-1/2 hours of daylight this time of year! Denali (Mt. McKinley) is hiding its peak behind those clouds, as it often does. We got a glimpse of the full mountain for a short period of time, thankfully! See the tiny people looking at the mountains? These two bull moose were found dead after having locked their antlers together having a battle. One pierced through the eye socket of the other. What an awful way to go! Nature can be cruel. A cutaway view of the soils and plants making up the tundra. It feels like walking on sponges. Some areas of the park look more like the southwest United States than Alaska! Next Post Have Online Job, Will Travel: But Is It Worth It? Thank you, and thanks again for all your insight about Denali! Great information on visiting the park. One day we will make this journey to Alaska. Thanks for the info, video, and beautiful photos! This is so helpful — thanks for all that info! Did you do much hiking, even on the popular trails? Is there much risk from grizzlies when hiking in this area? You’re welcome – thanks for reading! 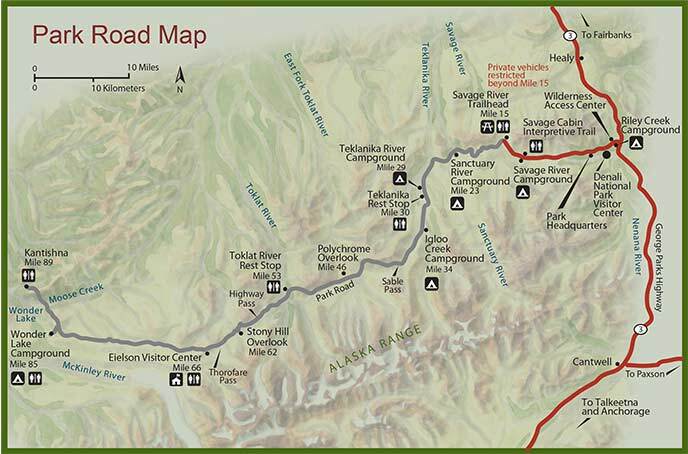 We did the popular trail at the Eielson Visitor Center, which is where we had the McKinley view, and also where the buses turn around if you do the 66 mile tour. For the green shuttle buses, there could be a long wait for the next one (a half hour to an hour) before the next one arrives, plus a chance it’s full and you’d have to wait for another, if you don’t get back on yours. We had to get back to our dogs and our trip out and back was already 8 hrs, so we used our half hour break at Eielson to do some easy walking amongst quite a few other hikers. Awesome tips guys and perfect timing for us! Thanks for taking the time to really hash out the details, you just saved us a bunch of time! Great tips for visiting Denali. Your photos are amazing and brought back wonderful memories of our 2013 trip from Georgia. We loved camping at Teklanika. I’ve heard so much great stuff about the Denali National Park. And looking at the pictures and videos just confirmed it even more that it’s a place I should definitely visit in my lifetime – and hopefully some time soon!